On July 10, 2018, the 8th Ministerial Meeting of the China-Arab States Cooperation Forum (CASCF) was held in Beijing. State Councilor and Foreign Minister Wang Yi co-chaired the Ministerial Meeting with Chair of the Arab side and Foreign Minister Adel bin Ahmed Al-Jubeir of Saudi Arabia. 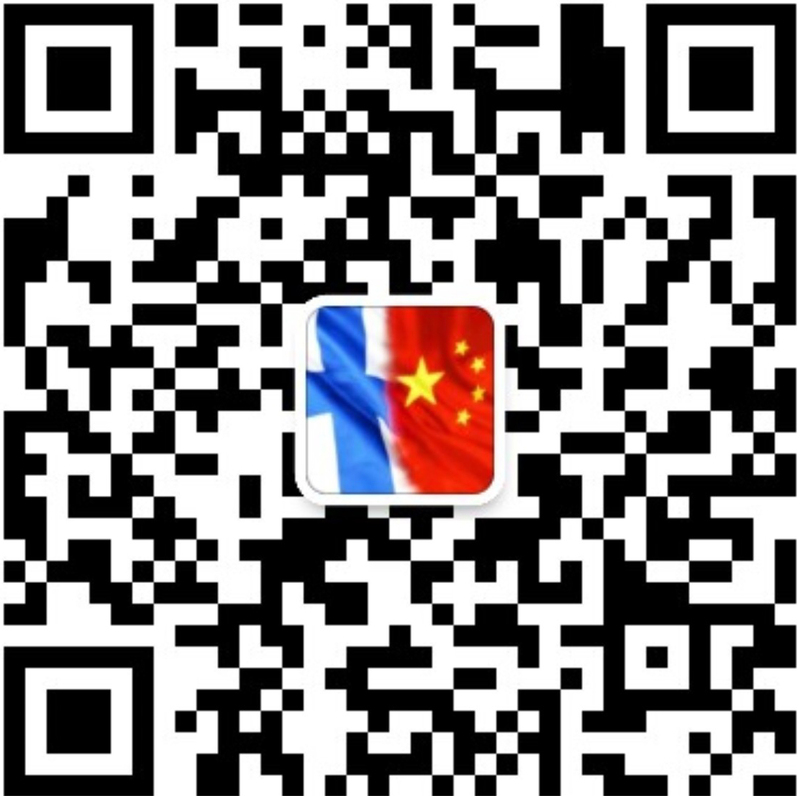 Wang Yi expressed that President Xi Jinping has put forward at the opening ceremony of the Ministerial Meeting that China and Arab states should enhance strategic mutual trust, realize the dream of rejuvenation, achieve mutual benefit and win-win results, and promote inclusiveness and mutual learning during the process of the joint construction of the Belt and Road hand in hand, so as to jointly build a community with a shared future for China and Arab states, making contributions to the building of a community with a shared future for mankind. China is willing to make joint efforts with the Arab side to constantly march toward this goal. 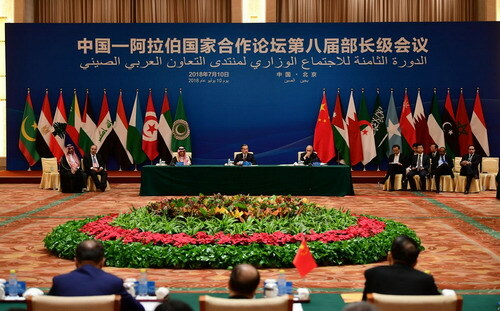 Wang Yi pointed out that China and Arab states agreed at this CASCF Ministerial Meeting to establish a future-oriented strategic partnership of comprehensive cooperation and common development, opening a new chapter of the relations between China and Arab states. Both sides should take the establishment of strategic partnership as an opportunity to enhance political mutual trust and firmly support the core interests of each other; take the joint construction of the Belt and Road as a platform to align development strategies and achieve advantage complementarities and win-win cooperation; and take the concept of common, comprehensive, cooperative and sustainable security as a lead to well safeguard the peace and stability in the Middle East and jointly strive for the long-term stability and peace of the world. 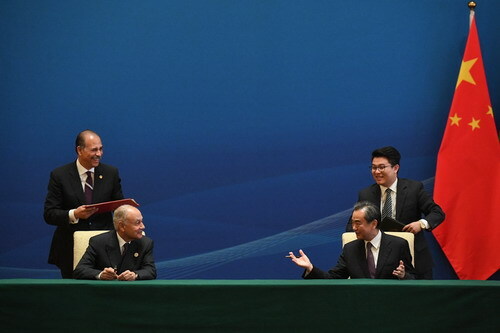 Wang Yi said that the CASCF is an engine propelling the development of China-Arab states relations. In the new era when China and Arab states establish a strategic partnership, both sides should keep up with the times to strengthen the building of the forum, so as to continuously provide dynamic impetus for bilateral friendly cooperation. Other ministers attending the Ministerial Meeting expressed that the Arab side totally agreed on the brand new blueprint for the development of Arab states-China relations drawn by President Xi Jinping in his speech at the opening ceremony of the Ministerial Meeting. The Arab side is highly consistent with China in the direction and philosophy of foreign policy, and stands ready to, together with China, earnestly implement the outcomes of the Ministerial Meeting and promote Arab states-China strategic partnership for forward-looking development. Highly appreciating China's long-term support for the just cause of Arab states, the Arab side welcomes the Chinese side to play a greater role in regional affairs in the Middle East. The Arab states are now exploring a development path that suits their national conditions, eagerly expect to participate in the Belt and Road construction, and stand ready to take this opportunity to deepen practical cooperation in various fields with China. The Ministerial Meeting adopted and signed three important outcome documents including the Beijing Declaration, the Action Plan for 2018-2020 and the Declaration of Action on China-Arab States Belt and Road Cooperation.